Glad to hear Leeds AFN had a good time with their film night. 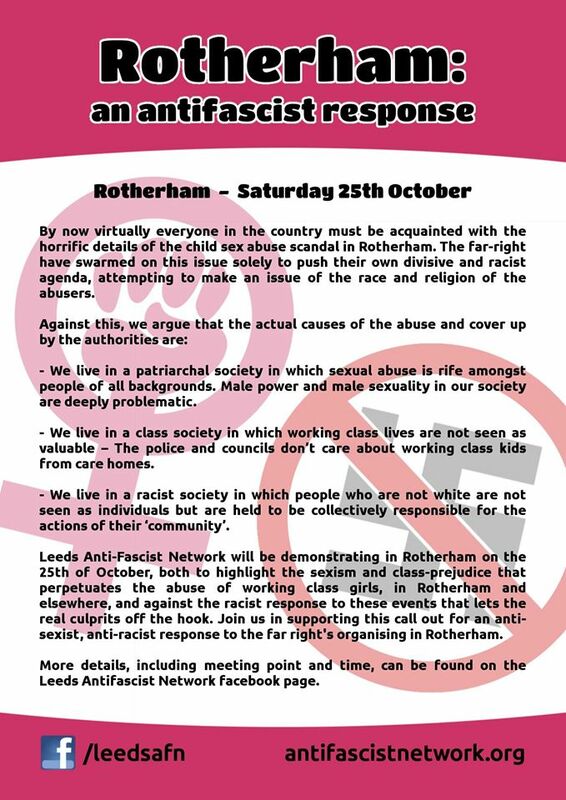 This coming Saturday, AFN affiliates Leeds Antifascists have organised a public protest in response to the far-right presence in Rotherham and the abuse scandal that led to it. Meet up at Rotherham Town Hall at Midday on the Saturday 25th Oct. Follow the Facebook Event page here for more info. The leaflet produced by Leeds AFN advertising the event. A small but determined group of anti fascists turned up to oppose about 300 EDLers marching in Batley on Saturday 9th August. A few of the EDL had a street stall in the market square while the rest gathered in their pub five minutes away. The Anti Fascist Network presence demonstrated at the entrance to the square until the police forced our group away as the EDL march approached. Anti fascists held a banner as the English and Israeli flags gathered for speeches before the fash got on coaches to get drunk in Leeds. Autonomous antifascists then caught up with those at the UAF We Are Batley event. Local Batley residents also confronted the EDL independently, though the police stopped some of them from holding a Palestinian flag. Meanwhile, in Portsmouth, 15 EDL members turned up to shout at a demo in support of Gaza. The EDL is not dead yet. Anti fascists everywhere need to get out and get active to confront racism on the streets. Why not come to the next event? For more detailed info on the demo see our previous post. The EDL are having a national demo in Batley, West Yorkshire this Saturday and as always anti-fascists will be there to oppose their racist hate-mongering. Batley is a small (about 10 min walk from one end to the other) working class town with a large Asian Muslim population. The pretext for the EDL’s demo is plans for a new Muslim faith school in the town. 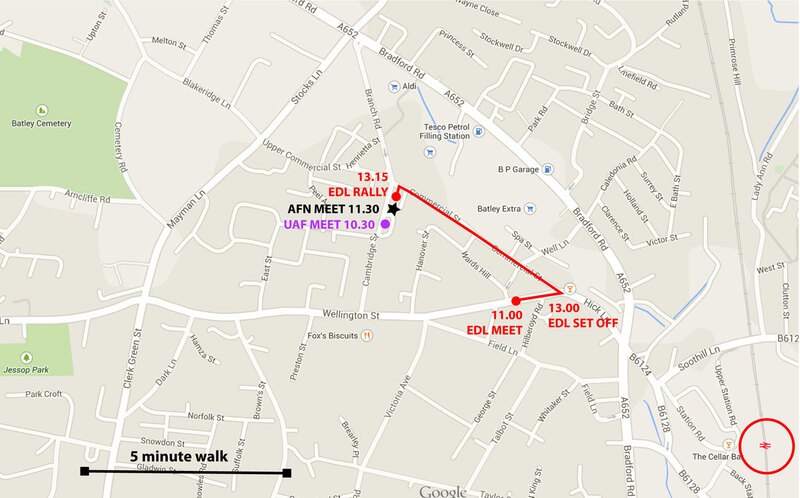 On Saturday 9th August join Leeds Anti-Fascist Network, Sheffield Anti-Fascist Network and other groups from the Anti-Fascist Network in opposing the EDL in Batley, West Yorkshire. Anti-fascists have been out distributing thousands of leaflets door to door in Batley and talking to local people, putting in the groundwork fro a successful local mobilisation. 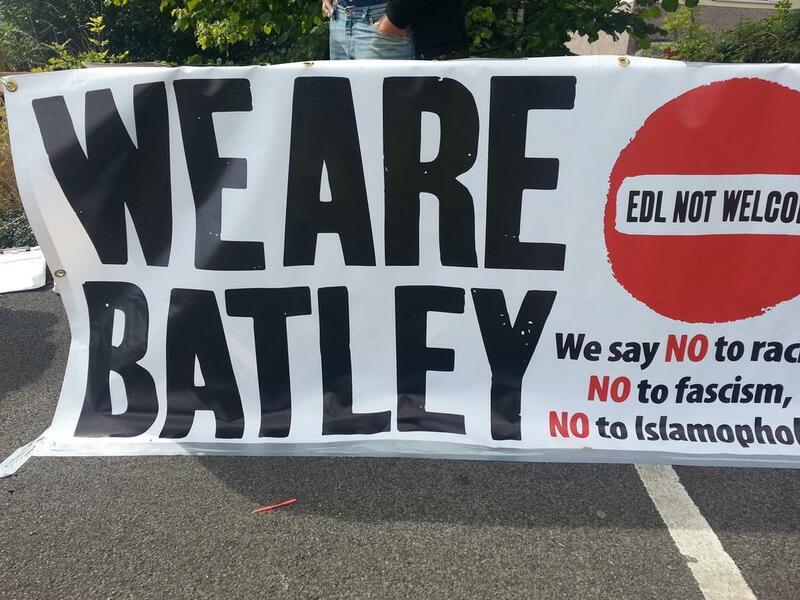 On Saturday 9th August the racist English Defence League (EDL) will be demonstrating against the creation of an Islamic faith school in Batley. We believe this is an attempt by the EDL stir up animosity between communities in order to build support for their message of hatred and racial division. We will be opposing the EDL on the 9th August.